Trade Mission Delegation, led by Maltese Prime Minister Joseph Muscat, visited the SocialGood, Tokyo. 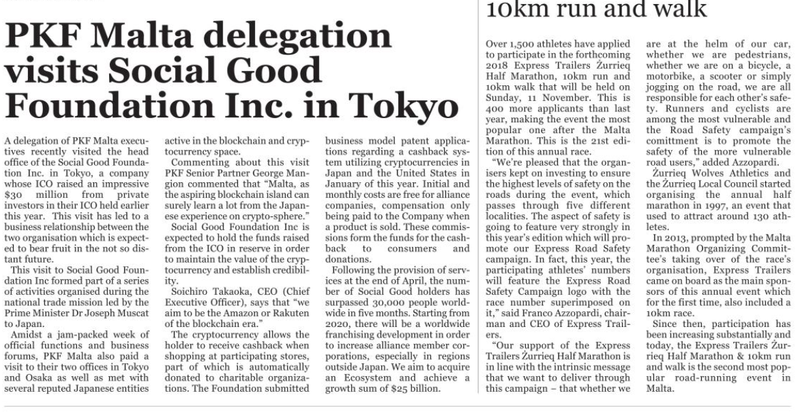 A delegation of PKF Malta executives recently visited the head office of the Social Good Foundation Inc. in Tokyo, a company whose ICO raised an impressive $30 million from private investors in their ICO held earlier this year. This visit has led to a business relationship between the two organisation which is expected to bear fruit in the not so distant future. This visit to Social Good Foundation Inc formed part of a series of activities organised during the national trade mission led by the Prime Minister Dr Joseph Muscat to Japan. Amidst a jam-packed week of official functions and business forums, PKF Malta also paid a visit to their two offices in Tokyo and Osaka as well as met with several reputed Japanese entities active in the blockchain and cryptocurrency space. Social Good Foundation Inc is expected to hold the funds raised from the ICO in reserve in order to maintain the value of the cryptocurrency and establish credibility. The cryptocurrency allows the holder to receive cashback when shopping at participating stores, part of which is automatically donated to charitable organizations. The Foundation submitted business model patent applications regarding a cashback system utilizing cryptocurrencies in Japan and the United States in January of this year. Initial and monthly costs are free for alliance companies, compensation only being paid to the Company when a product is sold. These commissions form the funds for the cashback to consumers and donations. Following the provision of services at the end of April, the number of Social Good holders has surpassed 30,000 people worldwide in five months. Starting from 2020, there will be a worldwide franchising development in order to increase alliance member corporations, especially in regions outside Japan. We aim to acquire an Ecosystem and achieve a growth sum of USD $25 billion.